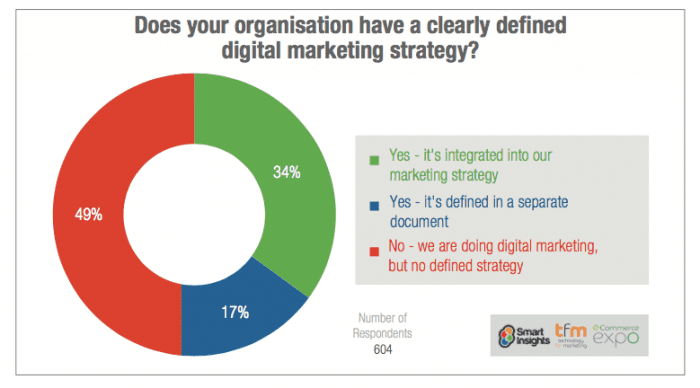 What percentage of businesses have a digital marketing strategy? 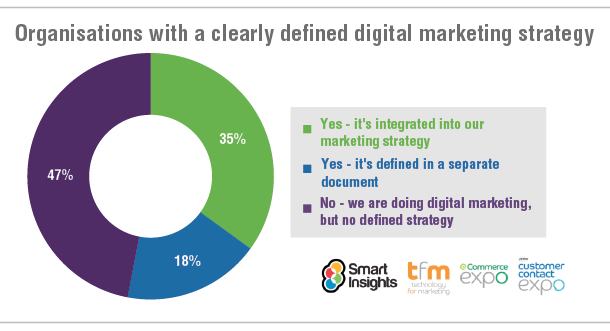 Chart of the Day: Do you need a separate, defined digital marketing plan or should it be integrated with your marketing strategy? In 2017 you will often hear that we live and work in a post-digital world. That is to say since consumers naturally use a mix of traditional and digital media, as businesses, we shouldn’t treat digital media and communications separately from other media and they should be integrated. ‘Post-digital’ is a compelling idea and I certainly believe that integration of digital activities into all marketing activities is essential, but what is the reality in businesses? The green sector in the chart shows that around one-third of businesses may have transformed to a ‘post-digital world’ with digital marketing integrated into their marketing as part of BAU (business as usual). It’s shocking that so many businesses are using and no doubt investing a lot in paid, owned and earned digital media, yet they don’t have a well-planned approach. There are many good reasons why a digital marketing strategy is useful – as with any type of marketing plan you need strategic direction, focus, goals, prioritisation and resource allocation. This figure suggests that many businesses are some way from ‘post-digital’ and digital transformation is needed. Perhaps more fundamentally this figure suggests there isn’t a culture of planning in organisations. We have found in previous surveys that, more shockingly still, a similar proportion, > 50% don’t have a marketing strategy or plan on which to base or align their digital marketing strategy with! The remaining blue segment on the chart accounts for around one fifth of businesses (17%) which are in transition. To take advantage of the opportunities of digital marketing you need to update your strategies, people, processes and technologies to be ‘digital-ready’. A plan is needed to get buy-in to digital marketing from colleagues and put the budget, resources and plan in place to support digital transformation. The ‘end-game’ should be full integration of digital media and technology into the organisation. What is a multichannel marketing plan?